Don’t have time to go out to sea, catch a tuna, and filet it? Don’t get your sushi mats in a knot! SakiTumi offers fresh sushi, hot and chilled sake, and a sleek wood-trimmed atmosphere right here in Columbia, SC. While SakiTumi is all about their sushi, there are a number of alternatives from the grill for those in your party lacking a taste for the stuff (or perhaps not using enough soy sauce). Check out SakiTumi’s tempting offerings here. We started off our meal with a round of the hot Gekkeikan Sake. Being amateur sake consumers and looking for a gentle introduction to the stuff (this was after hearing horrible things about Chinese rice wine from fellow Capital City Eatz-er and world traveler, Samantha August), we decided to play it safe and went with the blue-raspberry flavor. It was good, and kept getting better after each sake shot, but a well seasoned sake connoisseur might scoff at the less-than-traditional flavor. In no time at all, our waitress was back to take our appetizer and entrée order: “Drunken Shrimp” and the “Taka Okomi”. 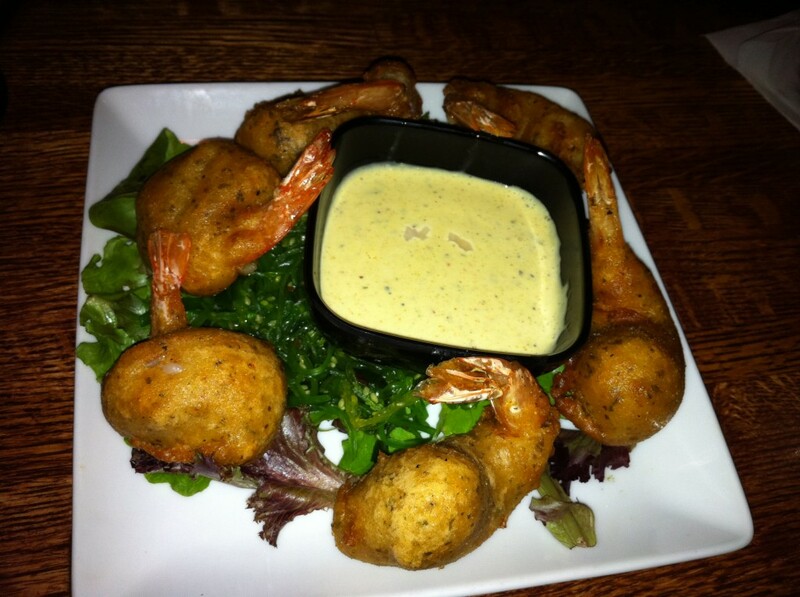 The “Drunken Shrimp” are beer battered and served with a Captain Morgan spiced curry sauce. Good but not great. As far as drunk goes, these prawns could probably have driven home. Not the slightest hint of rum, or curry, for that matter. Of course, it was fried so how bad could it be. Apparently its one of their best-selling dishes, but you are probably best served getting an early start on the sushi. Moving on to the Taka Okomi. The Taka Okomi consits of 1 california roll, 1 spicy tuna roll, 1 philly roll, 2 unagi nigiri, 2 tuna nigiri, 2 salmon nigiri, 2 shrimp nigiri, and 4 yellow tail sashimi. Advertised as “great for groups”, this dish and our appetizer was barely enough to satisfy four. If going swimming still sounds like a good idea after dinner, my stomach’s not happy. But maybe I’m being unfair. Rather than getting your stomach in shape for Thanksgivings, SakiTumi’s goal seems to be to surround its customers in a warm, fun-loving environment and serve fresh sushi paired with sake or one of their own creative cocktails. Don’t think of it as a restaurant- more like a sit-down bar that serves sushi. Of course, they do serve a few dishes from the grill, but thats an experience for another night. The sushi didn’t blow me out of the water, but it was good, and the atmosphere and feel that Saki Tumi has going for them will keep me coming back to try other items on their menu. 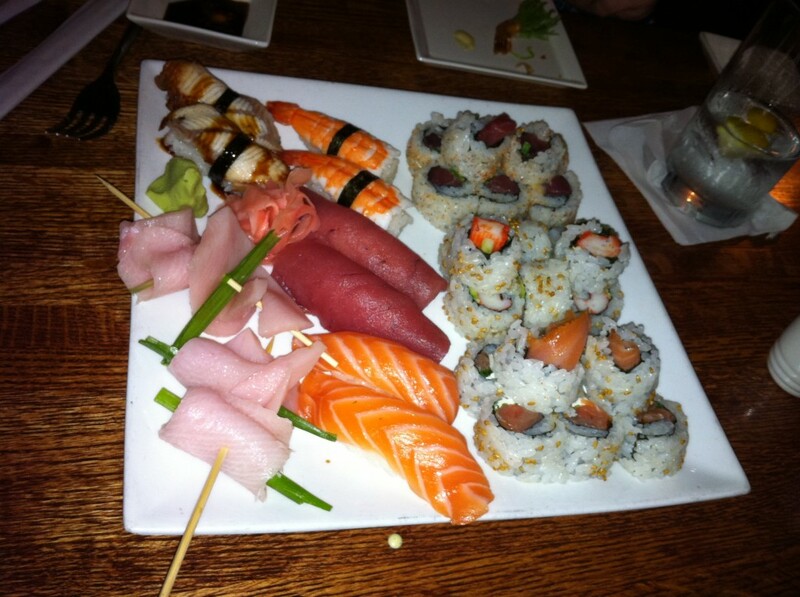 Come here to start off the weekend with a few drinks, a few friends, and quality sushi. This Columbia, SC restaurant was clean and the service was very good. Located in the heart of the Vista, SakiTumi is a great option for a Friday or Saturday night out with friends or date night. Check out their website for daily deals and other information. Tip: You can get $10 off your purchase of $25 or more here!